Photos of The Everglades National Park from April 2008. 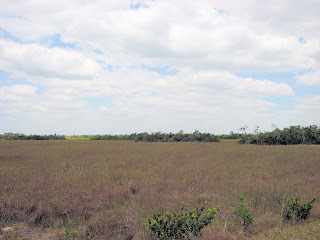 This page features the plants of the Everglades. 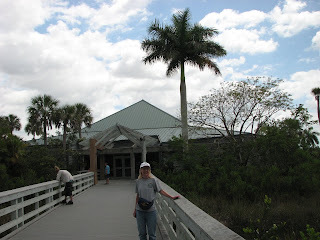 For animals see Everglades Fauna. Overview: Well, here we are having lunch at Long Pine Key, in Everglades National Park, in April of 2008. I'm Jess Stryker and my wife is Julie. 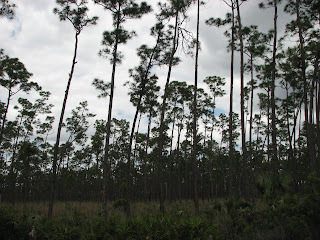 I'll assume you're not really interested in photos of us, so we'll move on to photos of the Everglades! The flora photos on this page follow the route of our 2008 visit through the park, starting on the Tamiami Trail (Highway 41) along the north edge of the park. 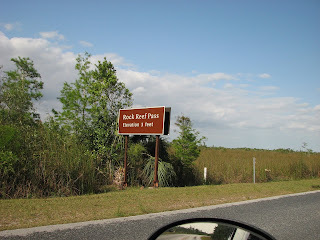 Then we moved down to highway 9336 which runs more or less south-west through the lower half of the park, down to Florida Bay. For a quick one-day visit highway 9336 (Main Park Road) is the best route to take, as you will see a little of everything. If you want to see cypress swamps up close it is best to take highway 41 to Big Cypress Bend. It is outside the National Park in an adjacent Florida State Park, a bit out of the way, but you can get up close to some beautiful mature cypress. We think it was worth the drive! We found the late morning and early afternoons the best time to get out and walk around. Be sure to coat yourself with lots (completely coat any exposed skin) of insect repellent before taking any early morning or afternoon walks (after 3 PM) or you will be bug food! Our visit was on April 18, 2008 along Highway 41, and April 19, 2008 on Highway 9336. This is the Shark River Slough in the north part of the park, near the Shark Valley Visitor Center off state highway 41. 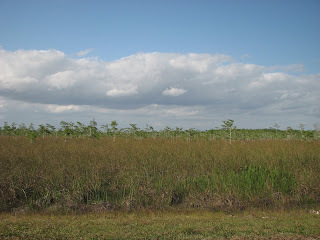 The Shark River Slough is the main "river of grass" in the Everglades and flows across the park from the north, sweeping in a wide curve to the west and the gulf of Mexico. It is a very shallow slough, ranging from a few inches to 3 feet deep. The width of the slough is between 10 and 30 miles if you only count the deeper areas. If the shallower areas (often called prairie rather than slough) are included it is up to 70 miles wide. The water flows very slowly through the slough, moving maybe 100 feet each day. It flows even slower in the shallow prairies. Sawgrass creates the primary plant in the slough and prairie. During the dry winter season some of the most shallow areas dry out. This photo was taken at the end of the dry winter season, so the grass is more brown than it would be at other seasons. The Sawgrass name comes from the tiny sharp teeth on the edges of the grass blades. They will cut bare skin if you are not careful. 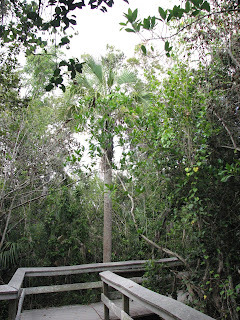 The large dark green plants in the photo are islands in the slough, these islands are called hardwood hammocks. The hammocks are covered with a dense growth of shrubs, vines and trees. This photo seems a bit ugly but it is part of a very important piece of the Everglades ecology. For most of the year this area in the photo is covered with very shallow water. If you look close you will see some small limestone ridges that would be partially submerged during the wet season. 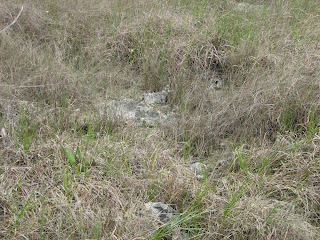 What you can't see well in the photo is that the ground below the grass is covered with a substance called periphyton. Up close periphyton looks a little like short stubby worms made of clay. Periphyton is a complex mixture of algae and various microbes that creates the basic food source for the Everglades wildlife. The smallest animals feed on the periphyton, and they in turn are eaten by bigger animals. Perhaps a bit boring to look at, but without it everything else dies! Not the most flattering photo of Julie, but I wanted her in it for scale. Throughout the Everglade sloughs are small islands formed from limestone, called hardwood hammocks. These islands are long and narrow, shaped somewhat like a tadpole when viewed from an airplane. They are aligned with the direction of flow of the water through the slough, as if they were tadpoles swimming upstream. 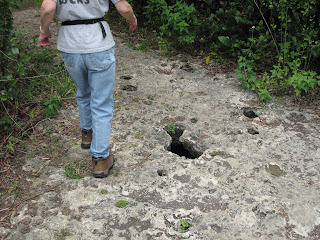 This photo was taken at the Otter Cave Trail in the Shark Valley area. Caves sometimes form under the limestone on the hammocks. You can see a small cave opening just to the right of Julie's feet. The cave is a couple of feet deep and may extend for several feet in each direction. The entire area under where Julie is standing is more or less hollow. 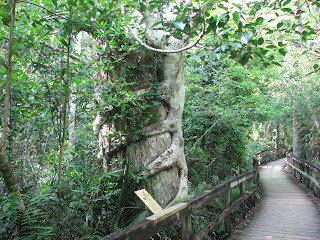 Another strangler fig vine on the trunk of a cypress tree. The strangler fig appears to be giving the cypress tree a big, unfriendly hug! The strangler fig's life starts when a fig seed falls, or is left by a bird, on the bark of a tree and wedges into place. 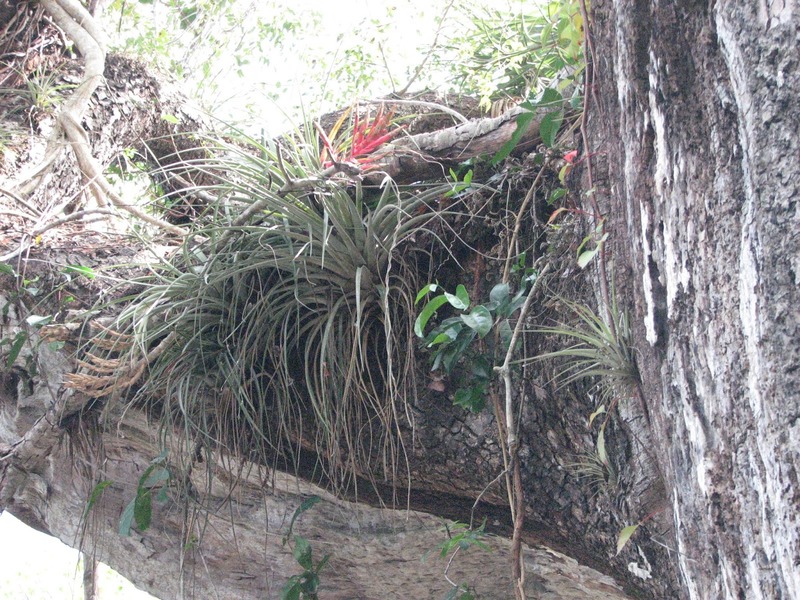 The seed sprouts, then sends aerial roots out which gather water from both the air and the surface of the tree. Eventually the strangler fig's roots reach the ground level where they root into the ground. While the roots are growing downward the shoots of the strangler fig climb up the tree toward the sun. 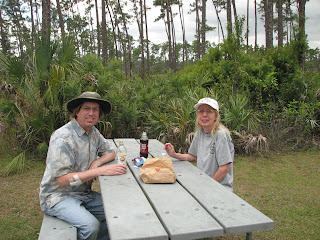 This photo was also taken at Big Cypress Bend, Fakahatchee Strand State Preserve (just outside of Everglades National Park.) 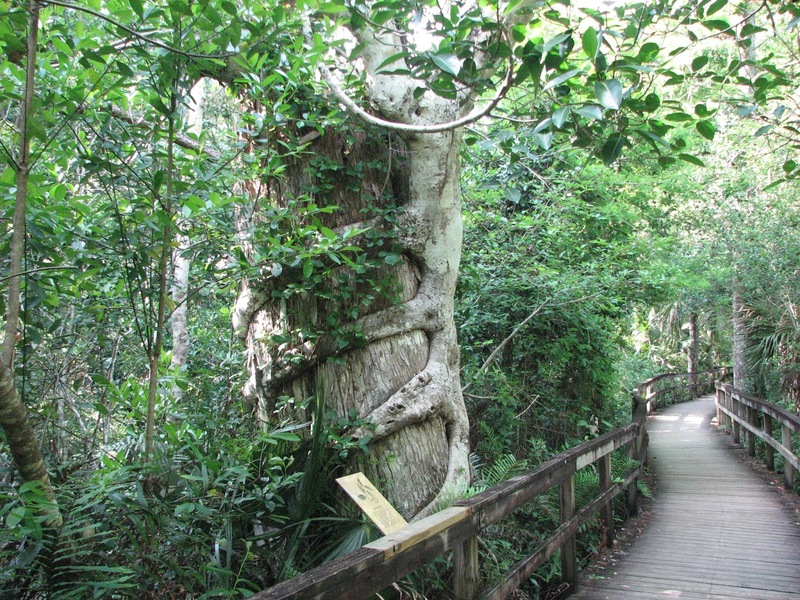 This gorgeous boardwalk trail at Big Cypress Bend is worth the drive outside the park. Julie at the Coe Visitor Center, which is located just inside the park entrance on highway 9336. The visitor center has many exhibits, including a large interactive exhibit for children. Yes, the person on the left is sagging a bit! The Royal Palm is perhaps the classic palm tree of Florida and is native to the Everglades. These are at the Royal Palm area, just inside the park entrance on Highway 9336. The Royal Palm area is also a good area for spotting wildlife. This is Long Pine Key. Being a Westerner, I tend to associate pine trees with the mountains. So you can imagine my surprise to see these groves of pine trees growing at about 8 feet above sea level. 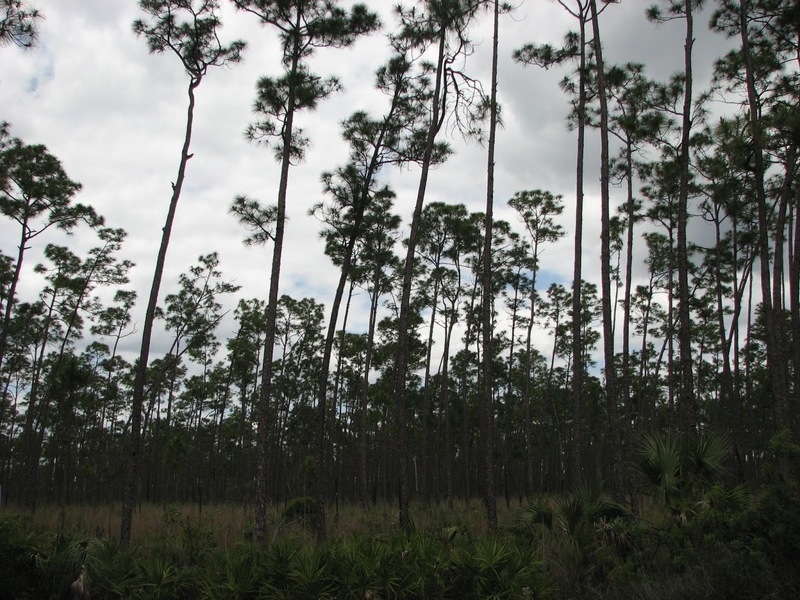 These Slash Pines are native to the Everglades and grow on slightly higher ground in the east portion of the park. The area was heavily logged at one time, this is primarily second growth. Most of the hiking trails in the park are located in this area where the elevation is slightly higher and there is more dry ground to build trails on. Just south of the Long Pine Key is a large area of former farmland that is being restored to swamp. 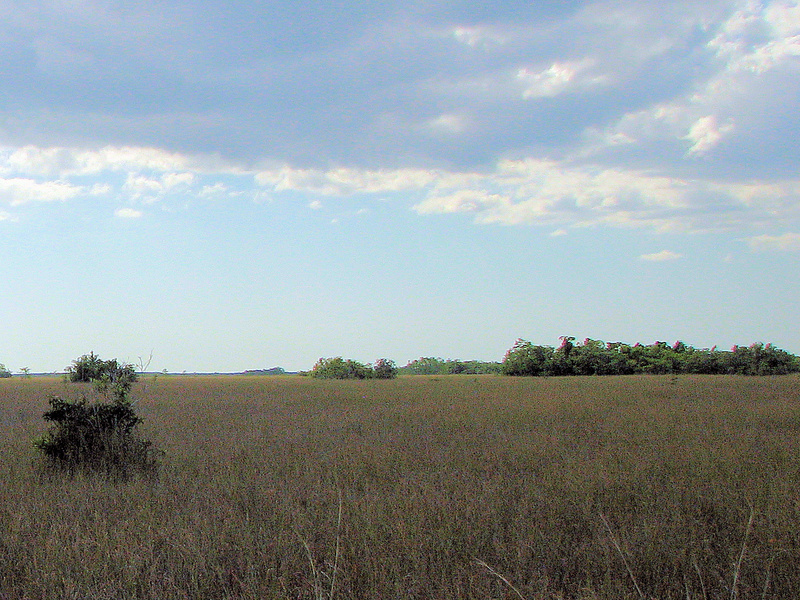 This is a panoramic view taken from the Pa-hay-okee Overlook in the Everglades. The Overlook looks out over the freshwater marl prairie toward Shark River Slough. The primary difference between Slough and prairie is that in the Slough the water is slightly deeper. There are fewer hammocks and more open space in this area of the park. The small trees you can see are Bald Cypress, despite their stunted size, they can be quite old. These cypress tend to be growing in deeper potholes in the prairie. To see this image in high detail, click on the photo above. These are small (but full-grown) Bald Cypress Trees. They are stunted due to lack of soil depth, poor soil quality, and shallow water. Bald cypress trees like lots of water and can grow in standing water. View of a Cypress Dome. The tallest trees are growing in deeper water, the smaller stunted trees are growing in shallow water, where their root systems are limited. These islands of vegetation in the middle of the prairie are called hardwood hammocks. Tropical hardwood plants grow on these higher islands, where their roots won't be submerged. The hammocks are extremely dense, with many varieties of trees shrubs and vines. The hammocks are also the habitat of many of the larger mammals in the Everglades. When viewed from above the hammocks are long and narrow, shaped something like a tadpole. The flow of water carves them into the shape over many many years. 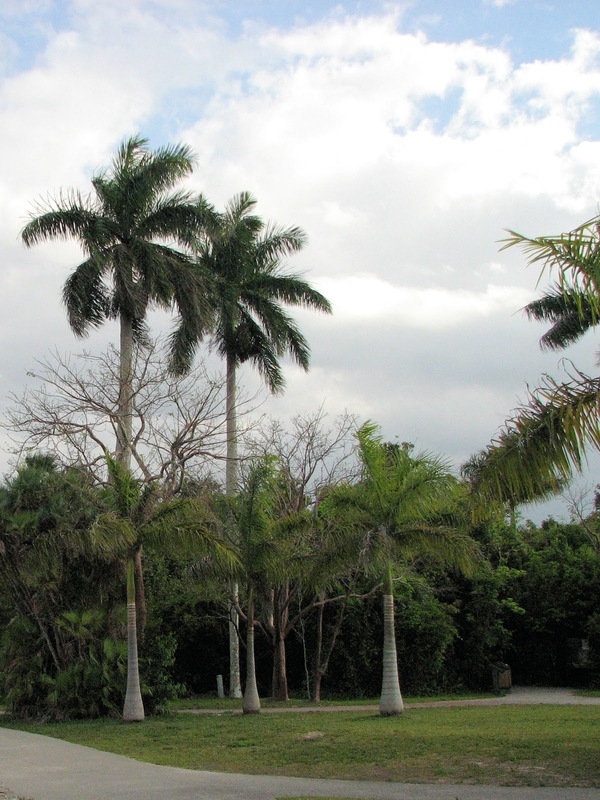 The palms in this photo are Everglade Palms. 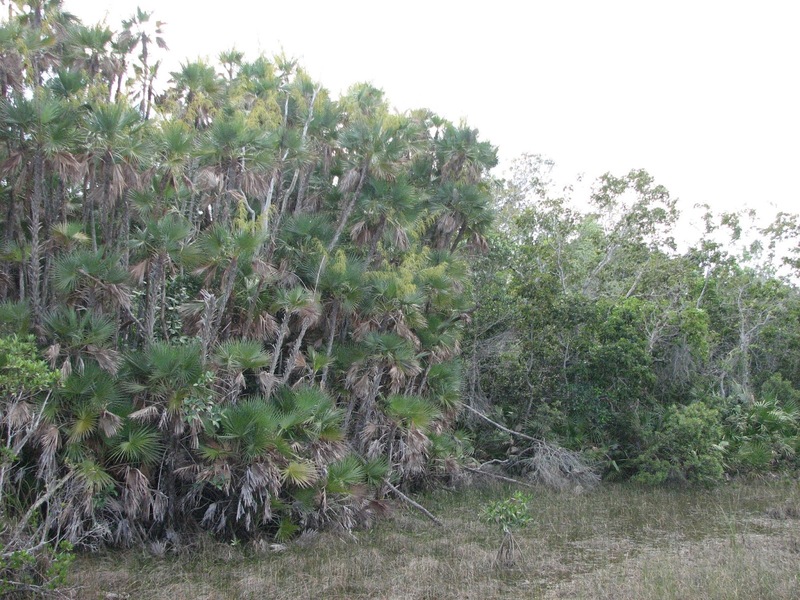 The Everglades Palm is a multi-trunk fan palm. Fan palms are identified by the fan shaped fronds (leaves.) 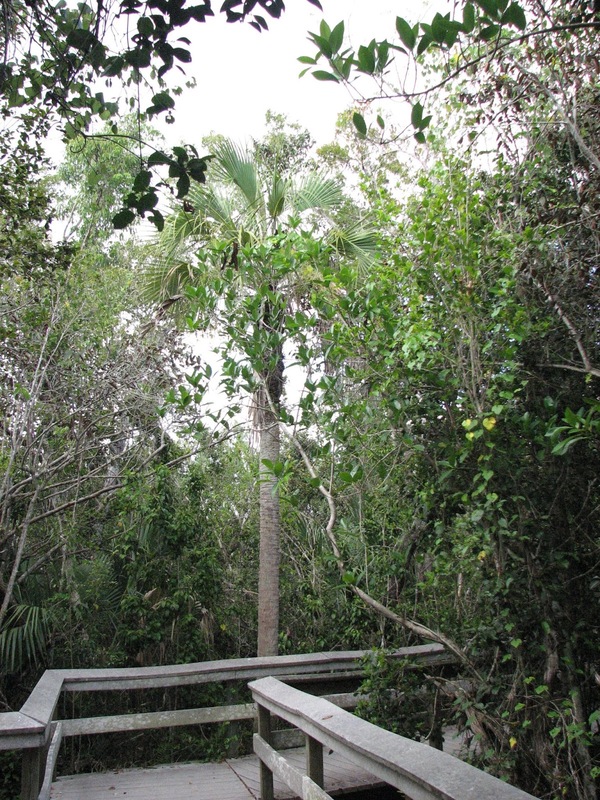 Everglades palms grow in large, dense clumps consisting of many trunks. Like this clump they often grow at the edge of a hammock where the dry ground meets the slough or prairie. 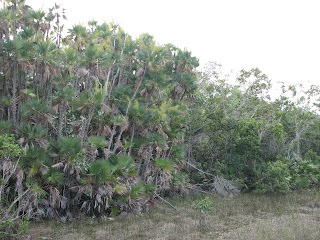 This is a Sabal-Pallmeto Palm, also called a Cabbage Palm. It is partially hidden by the foliage of other trees. These fan palms grow in the higher and drier center of the hammocks, making them a bit hard to get a photo of, due to surrounding trees. 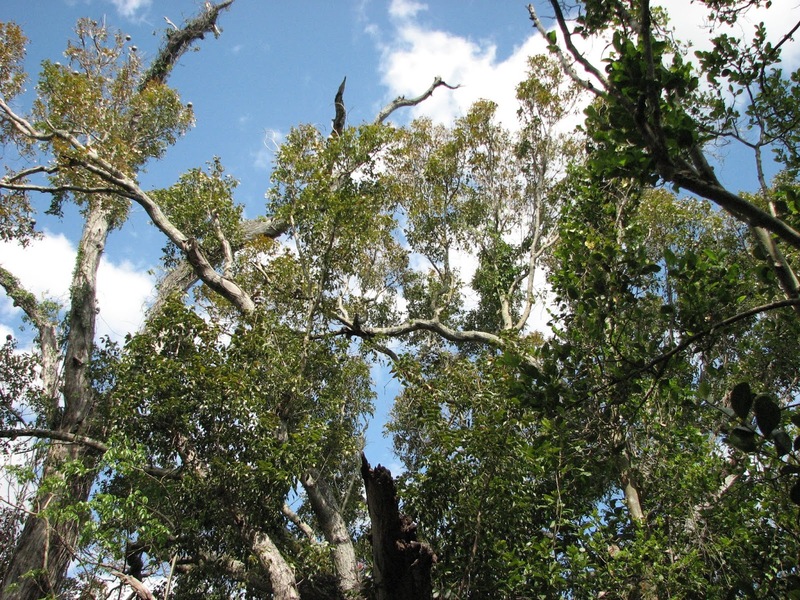 This photo was taken looking up at a rare, mature Mahogany Tree in the Everglades. 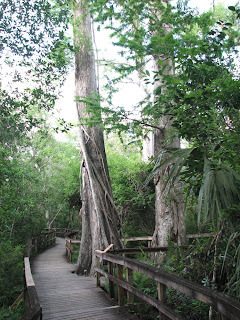 This one is at Mahogany Hammock. 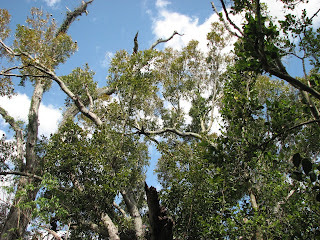 Most of the Mahogany Trees were logged for furniture wood prior to establishment of the park, so mature ones are rare. This is a nurse log in the middle of one of the hammocks. A nurse log is a fallen log that is rotting. The rotted wood provides stabilization and nutrition for small plants growing on it. 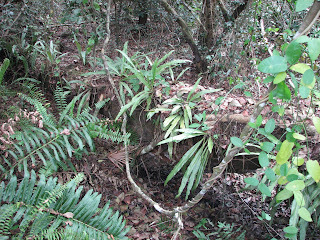 If you look closely at the photo you can see that many of the plants in the photo are growing directly out of the top and sides of the fallen log. Nurse logs are common in almost all forests. Next time you're hiking in the forest look around and see how many you can spot. 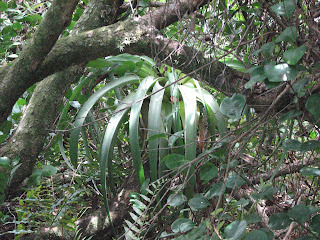 A large bromeliad, with strap-like leaves can be seen just below the large branch in this photo. This one has wide strap-like leaves and is growing on the trunk of a tree. 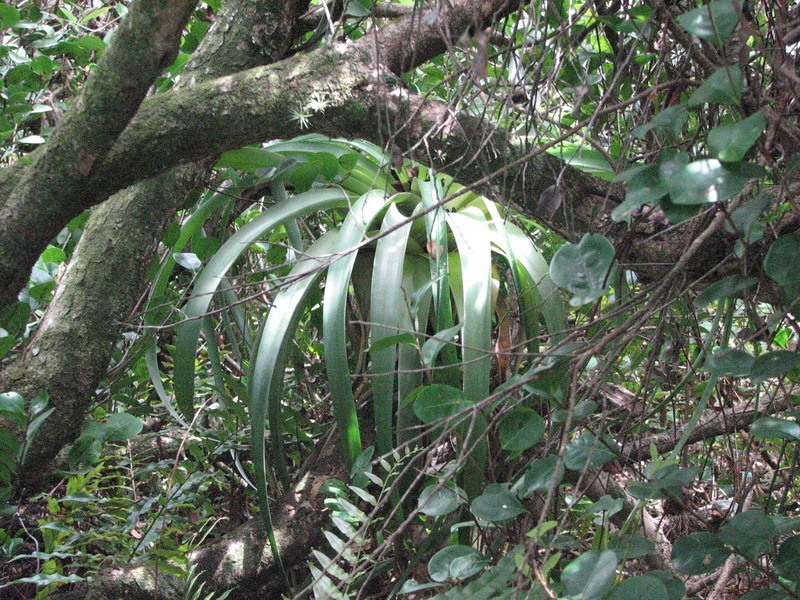 It is a epiphyte, which means it attaches itself to another plant. Epiphytes are sometimes called air plants because they do not need to root into soil to survive. 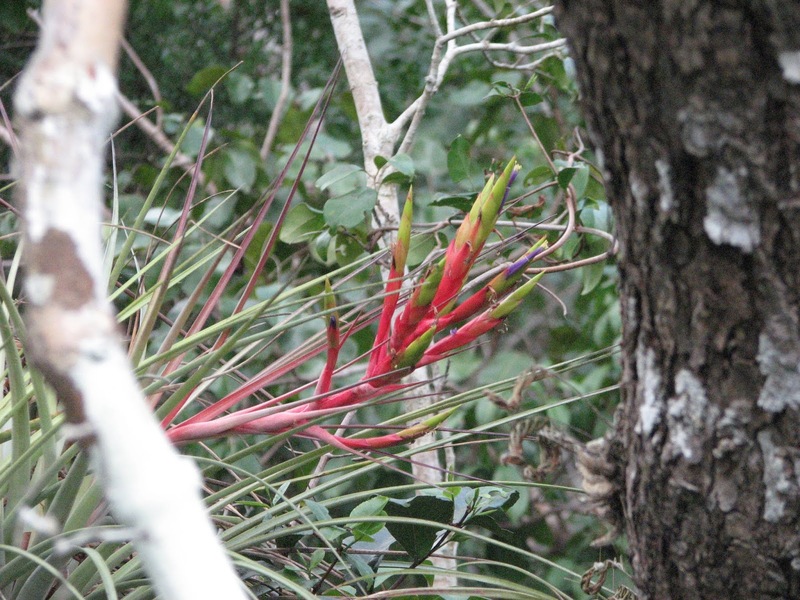 The plant with a red flower is a Cardinal Wild-Pine. 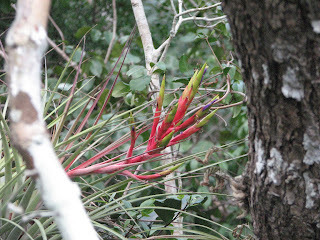 Also called Cardinal air plant, this is another bromeliad. This one is growing high above the ground on the branch of a tree. Close-up photo of a Cardinal Wildpine flower. 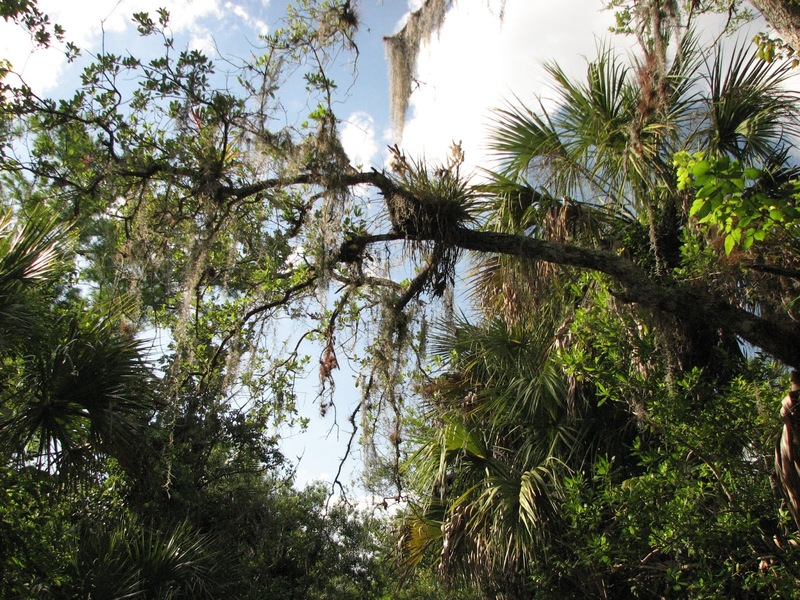 In this photo you can see light colored Spanish Moss (Florida Moss) hanging from the branches of a tree. Due to the dry season when this photo was taken, the Spanish moss is looking a bit gray-white and dry. Spanish moss is also a epiphyte, which means that it does not attack its host plant for food. Sometimes called an air plant, Spanish Moss does not have any roots. It attaches to branches of other plants using stems. The stems form a tangled mass which hangs down from the branches of the host tree and collect moisture from the air. In this photo you can also see a couple of Cardinal Wildpines growing on the same branch. 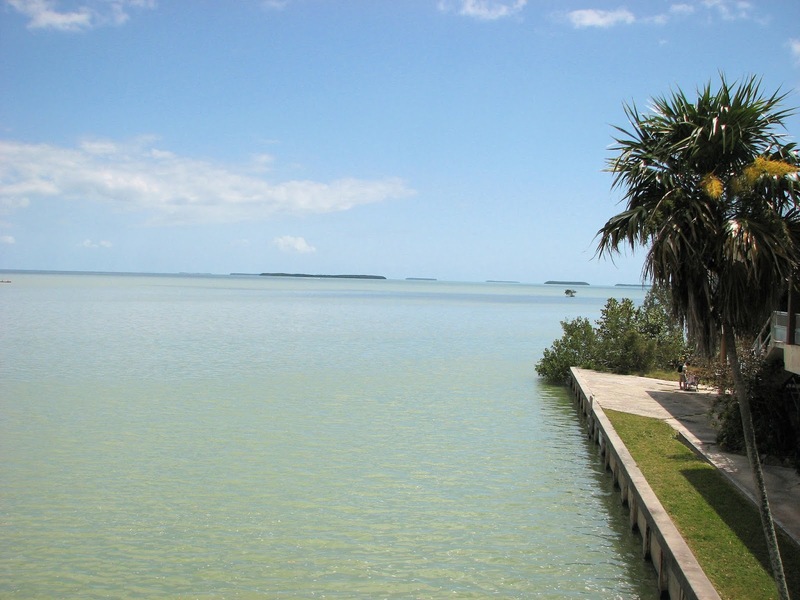 As we drive further south-west through the Everglades we reach the area where the fresh water from the sloughs and prairies meet the salt water of Florida Bay and the Gulf of Mexico. In this area the slough and prairie are replaced by dense swamps, river-ways, and small lakes. Red Mangrove Trees grow in the shallow water along the edge of the lakes, rivers, and bays. 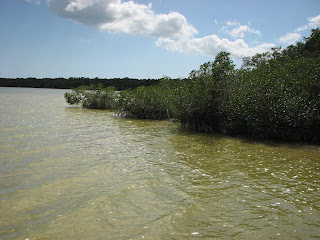 The red mangrove trunks are supported above the water level by many roots, called prop roots. These dense prop roots help protect the shore from the wave action of storms. The protected water under the prop roots of the red mangrove trees also serves as an important breeding ground for fish and other animals. In the photo you can see the prop roots extending down into the water from the branches. 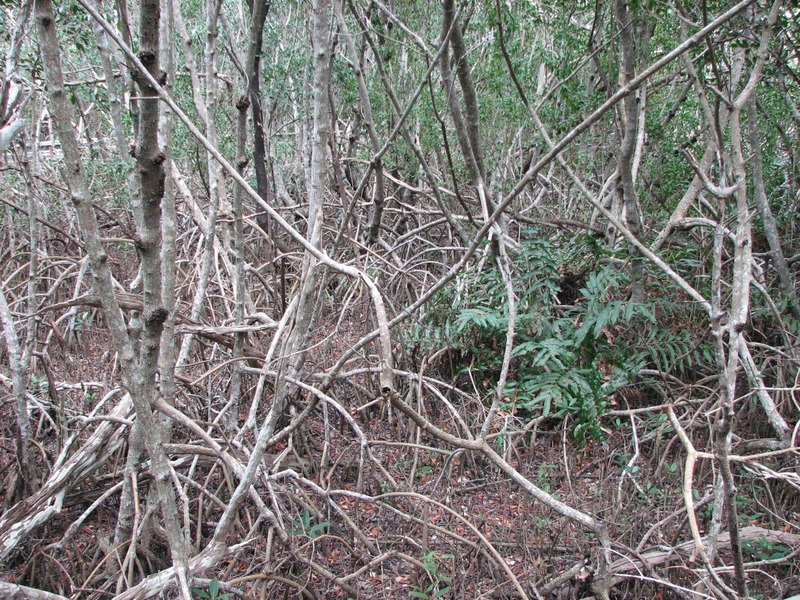 The dense aerial roots of the Mangrove Trees make the swamp almost impenetrable for humans. The best way to get around this area is by following the river ways using a canoe or flat-bottom boat. 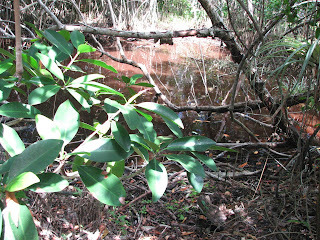 The swamp water is dyed red by the red roots of the Mangrove Trees. These are black mangrove Trees. The black mangroves grow in the very shallow swamps away from the deeper water where the red mangroves grow. 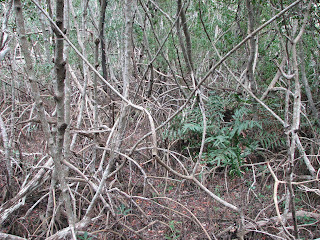 Black mangroves can be identified by their unique root structures called Pneumatophores. Pneumatophores are roots that grow straight up out of the ground and look like pencils or new shoots, however they are actually roots that grow up rather than down. In this photo they look like sticks that have been stuck into the ground. They serve as breathing structures that furnish oxygen for the roots that are submerged below water in the swamp. This photo was taken at the driest time of the year, so most of the swamp has dried out around the base of the trees. Notice the leaf build-up around the roots, these leaves are trapped by the roots and will soon rot and become soil. 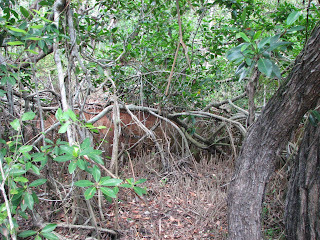 This soil building by the leaf drop of the mangroves trees is a key part of the Everglades ecology. There is a constant cycle in the area where the sloughs meet Florida Bay and the Gulf of Mexico: Red Mangrove Trees grow up and serve as barriers that allow the open water to become a new swamp, then black mangroves grow and turn the swamp into dry land. Other less water tolerant plants can then move in and take over. Finally a hurricane comes in and blows it all way and the process starts again. 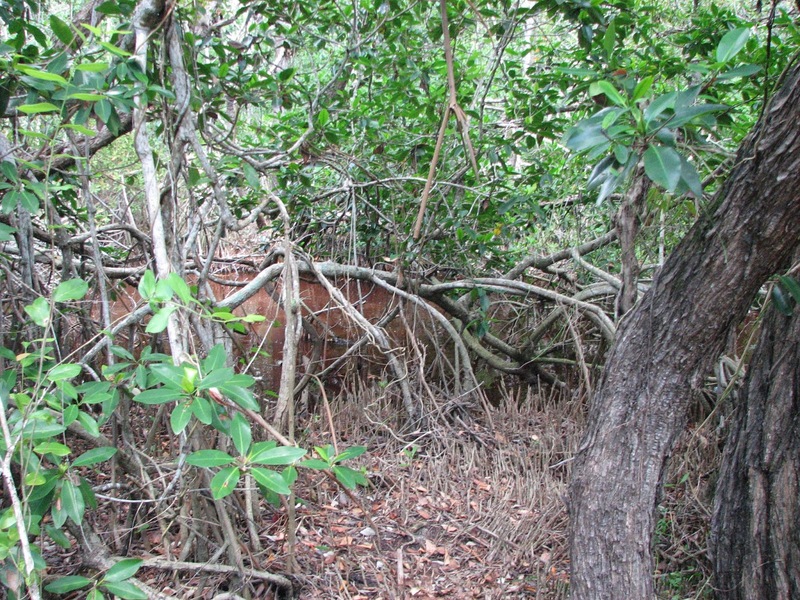 To clarify, red mangroves have roots that grow down from branches into the water. Black mangroves have roots that grow up out of the water or mud into the air. Highway 9336 ends at the area called Flamingo when it reaches the shore of Florida Bay. This photo was taken from the landing at the Flamingo Visitor Center. 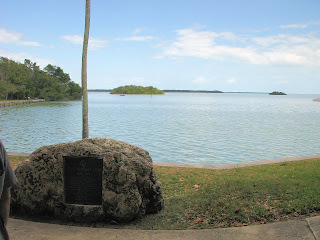 The small islands in Florida Bay are called key's. There are over 200 of these mangrove islands in the bay. The water of the bay is only about 6 feet deep maximum, most of the area is less than 3 feet deep! Boaters must be extremely careful due to the shallow water. Another photo of Florida Bay from the Flamingo Visitor Center. 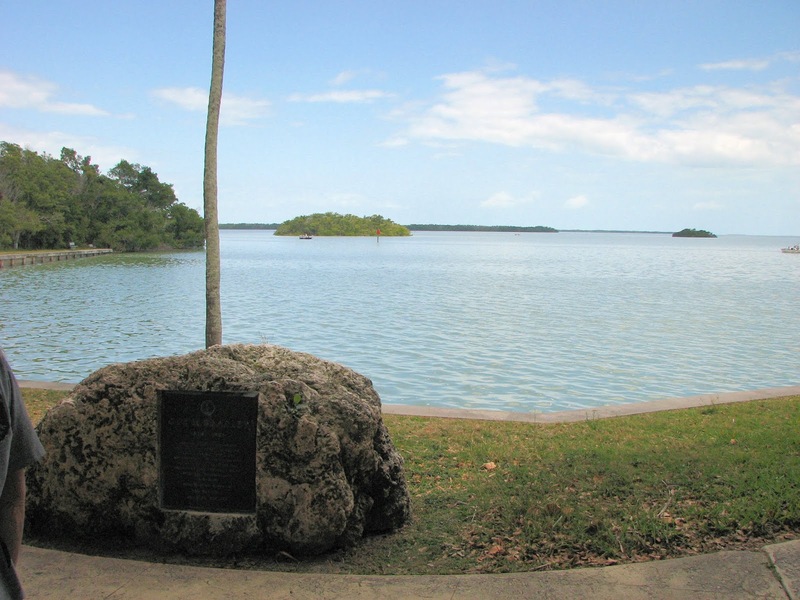 Florida Bay is popular for fishing, there are boat rentals, a launch ramp, and a marina store at Flamingo. There is also a campground. At the time of our visit the motel and restaurant at flamingo were both closed and abandoned due to hurricane damages in 2005. The old hotel and restaurant buildings were torn down in 2009.